Home › National bird of India › Japanese quail › Cape petrel - Daption capense. The Cape petrel (Daption capense) is a seabird belonging to family Procellariidae. The Cape petrels are distributed in the Southern Ocean with an estimated population of two million. There are two recognized subspecies of these birds. The subspecies D. c. capense occurs in Antarctic and subantarctic islands. The subspecies D. c. australe occurs in Antarctic seas between Australasia, New Zealand and Antarctica. During the winter they range further north visiting African coast and Indian islands. The Cape petrels are small birds, measuring 35 to40 cm in length and weighing 350 to500 grams. They have wingspan of 90 cm. Their head is black with white belly and breast. The underwings are white with black border. Their upper wings and back are black, speckled with white. These petrels feed on krill, crustaceans, fish and squids. They seize their prey from the sea surface as well as by diving.under water. They produce stomach oil, which they spray out when threatened. These petrels have a salt gland in their nasal passage and excrete high saline solution to desaline themselves. 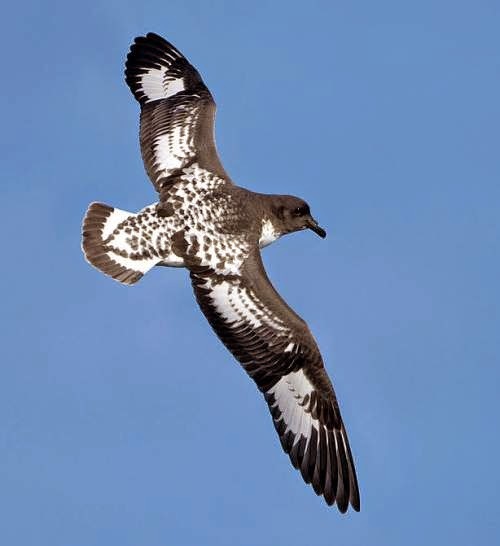 Current topic: Cape petrel - Daption capense. Home › National bird of India › Common quail › Japanese quail - Coturnix japonica. The Japanese quail, (Coturnix japonica) belongs to the family Phasianidae. The Japanese quails are distributed in India, Korea, Japan, Bhutan, Myanmar, Thailand, Mongolia, Russia, Vietnam, Cambodia, Laos and China. These birds have been introduced to Hawaiian Islands, Reunion and Italy. Domestication and selective breeding has produced many strains. The International Union for Conservation of Nature (IUCN) had categorized and evaluated these quail species and had listed them as 'Near Threatened'. These quails are small birds, measuring 17 to 20 cm in length and weighing 90 grams. The females have brown plumage with dark spots on the breast region. The males breast feathers have uniform dark brownish-red color. The cheeks of males are also brownish-red whereas in females the cheeks are cream colored. The females are slightly larger than the males. They inhabit open areas steppes, meadows, and mountain slopes near a water source and dense vegetation. They feed on seeds, cereals, grains, insects and small vertebrates. The birds are generally monogamous. Some instances of polygamy had been noted. Female birds incubate the eggs and provide parental care to the hatchlings. 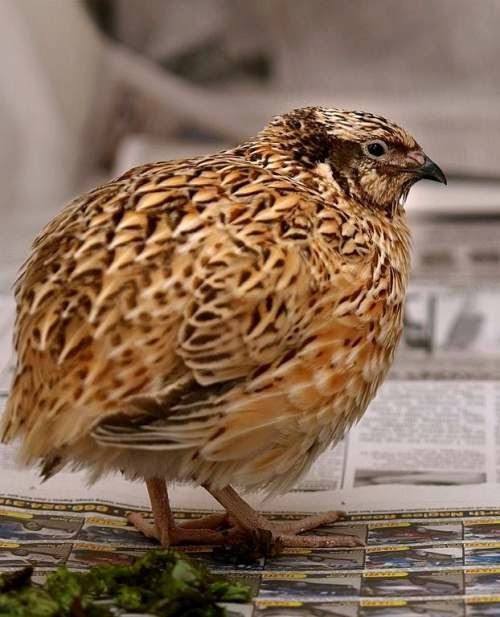 Current topic: Japanese quail - Coturnix japonica. Home › Indian National Bird › Rain quail › Common quail - Coturnix coturnix. The common quail (Coturnix coturnix) belongs to the pheasant family Phasianidae. The common quails are distributed in Europe, Russia, Mongolia, Africa and India. There are four recognized subspecies of these quails. The subspecies C. c. coturnix occurs in Europe, Russia, Mongolia, South and northwest Africa, India and Bangladesh. The subspecies C. c. confisa occurs in Canary Islands, Madeira and Azores. The subspecies C. c. inopinata occurs in Cape Verde Island. The subspecies C. c. africana occurs in sub-Saharan Africa, Ethiopia, Uganda, Namibia, South Africa, Madagascar, Angola, Congo, Namibia and Zambia. The International Union for Conservation of Nature (IUCN) had categorized and evaluated these pheasant species and had listed them as 'Least Concern'. These quails are small round birds, measuring 16 to 18 cm in length and weighing 70 to 150 grams. They are migratory birds and have a wingspan of 35 cm. Though they look very similar to Coturnix japonica, C. japonica are game birds and have short wingspans. They inhabit open grasslands and cultivations. They feed on grains, seeds, leaves and insects. Six to twelve eggs are seen in the nest. Current topic: Common quail - Coturnix coturnix. Home › Indian national bird › Blue-breasted quail › - Rain quail - Coturnix coromandelica. The rain quail (Coturnix coromandelica) belongs to the family Phasianidae. These birds are distributed in the Indian Subcontinent, viz., Bangladesh, India, Cambodia, Nepal and Pakistan and also in Thailand, Vietnam, Cambodia and Myanmar. The International Union for Conservation of Nature (IUCN) had categorized and evaluated these bird species and had listed them as of 'Least Concern'. These quails are small birds, measuring 16 to 18 cm in length and weighing 65 to 85 grams. The male birds have a distinctive black patch on the breast. The male bird also has a distinctive black and white head pattern. They inhabit open grasslands. These rain quails feed on insects, grass, seeds, seeds and other plant matter. They breed during March to October. They are considered monogamous. The quail nest usually contains six to eight eggs and the female incubate the eggs. 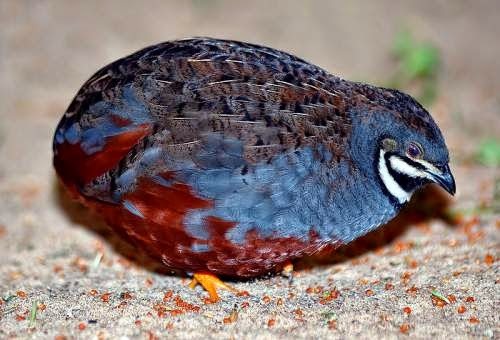 Current topic: Rain quail - Coturnix coromandelica. Home › National bird of India › Jungle bush-quail › King quail - Coturnix chinensis. The king quail (Coturnix chinensis), also known as blue-breasted quail, belong to the pheasant family Phasianidae. 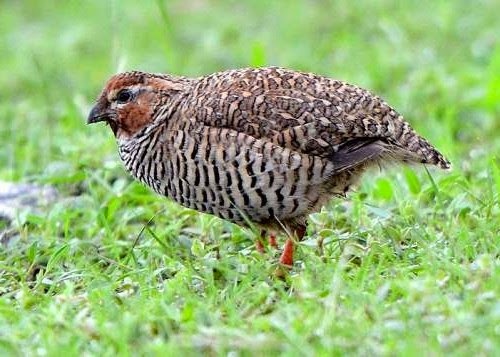 The king quails are distributed in India, Sri Lanka, China, Taiwan, Indonesia, Philippines, australia and New Guinea. They are presently included into genus Synoicus. There are ten recognized subspecies of these birds. The subspecies are: S. c. chinensis, S. c. trinkutensis, S. c. palmeri, S. c. lineatus, S. c. lineatulus, S. c. novaeguineae, S. c. papuensis, S. c. lepidus, S. c. colletti and S. c. victoriae. These quails are small game birds, measuring 12 to 15 cm in length and weighing 20 to 60 grams. Male birds are colorful and come in several colors. They have orange feet. They inhabit swampy grassland, shrub jungle, swamp edges and paddyfields. They feed on grass, seeds, grains, cereals and insects. They breed after the rainy season and a clutch may contain up to eight eggs. Current topic: King quail - Coturnix chinensis. Home › Indian national bird › Rock bush-quail › Jungle bush-quail - Perdicula asiatica. The jungle bush quail (Perdicula asiatica) belongs to the family Phasianidae. 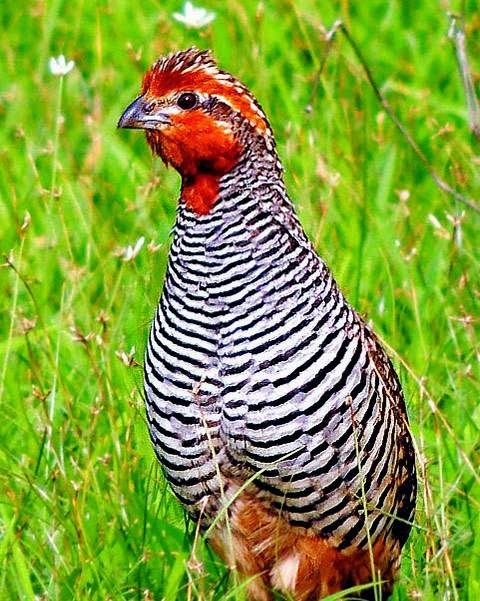 The jungle bush quail is distributed in the Indian subcontinent, ranging across India, Nepal, Pakistan and Sri Lanka. There are five recognized subspecies of these quails. The subspecies P. a. punjaubi occurs in northwest India, from Kashmir to Uttar Pradesh. The subspecies P. a. asiatica ranges from Bihar to Gujarat in central and northwest India. P. a. vidali is found in southwest India. P. a. ceylonensis occurs in Sri Lanka. The subspecies P. a. vellorei occurs in south India. The International Union for Conservation of Nature (IUCN) has categorized and evaluated these quail species and has listed them as of "least concern". 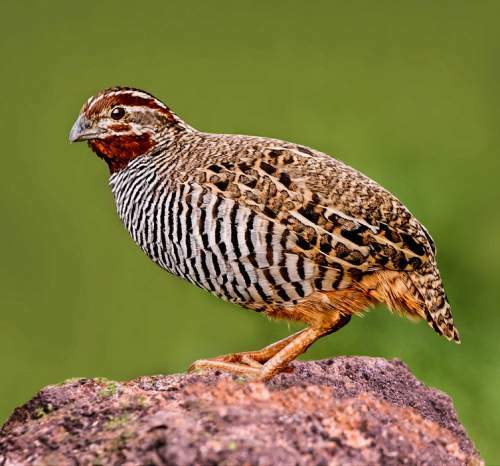 This quail is a small bird, measuring 15-20 cm in length and weighing 50-80 grams. Male birds have heavily barred white underparts, and variegated wings. The females have rich chestnut colored belly and underparts. There white and red streaks on the head. They feed on seeds, grass and insects. These birds inhabit dry scrub jungles. They breed after the end of rainy season. Five or six eggs are laid and the female incubates the eggs.
. Current topic in Birds od India: Jungle bush-quail - Perdicula asiatica. Home › National bird of India › Black-throated loon › Rock bush-quail - Perdicula argoondah. The rock bush quail (Perdicula argoondah) belong to the family Phasianidae. There are three subspecies of rock bush quail. The subspecies P. a. meinertzhageni occurs in northwest Indian regions like, Haryana, Kutch, Saurashtra and Madhya Pradesh. The subspecies P. a. argoondah is found in peninsular India, in the states Madhya Pradesh, Andhra and Tamil Nadu. The subspecies P. a. salimalii is found in the southern states of India, Karnataka and Kerala. These quails are small birds, measuring 15-18 cm in length and weighing 50 to 75 grams. These birds inhabit dry, shrub bushes. They feed on seeds, grains, insects and plant waste. They breed during January to March. build their nests under rocky cover. Current topic Birds of India: Rock bush-quail - Perdicula argoondah. Home › Indian national bird › White-tailed tropicbird › Black-throated loon - Gavia arctica. 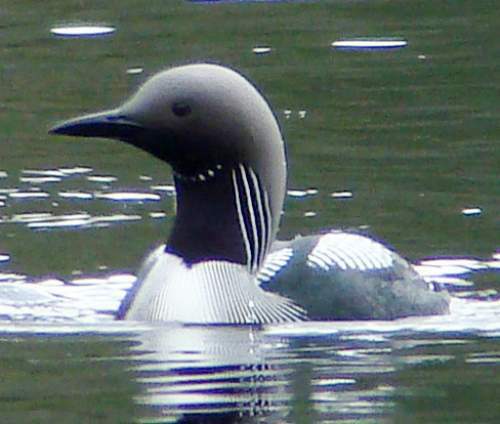 The black-throated loon (Gavia arctica) belongs to the family Gaviidae. The black-throated loon is a migratory aquatic bird found in northern Europe, northern Asia, eastern Russia, North America and Alaska. There are two recognized subspecies of these loons. The subspecies G. a. arctica occurs in northern Europe and northern Asia, wintering in Mediterranean, Black and Caspian Seas. The subspecies G. a. viridigularis is found in eastern Russia and Alaska. These birds move southwards in winter are a rare visitors to Indian waters. 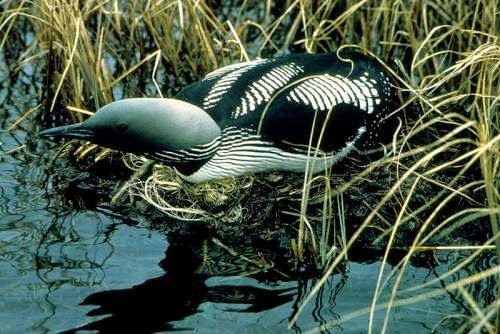 The International Union for Conservation of Nature (IUCN) has categorized and evaluated these loon species and has listed them as of "least concern". These loons are large birds, measuring 60-75 cm in length with a wingspan of 110-130 cms. and weighing 1,300 t0 3,500 grams. Their head is dark grey, and their throat is dark grey in color. There is a distinct white and dark grey pattern on the back, shoulders and lower neck. The dagger shaped bill is dark grey and the eyes are deep red. They feed on fish, crustaceans and mollusks. These loons are monogamous and the female incubates the eggs. Both the parents take part in feeding the chick. Current topic in Birds of India: Black-throated loon - Gavia arctica. Home › National bird of India › Red-tailed tropicbird › White-tailed tropicbird - Phaethon lepturus. The white-tailed tropicbird (Phaethon lepturus) belongs to the tropicbird family, Phaethontidae. Of the three closely related tropicbirds, this tropicbird is the smallest. It occurs in the tropical Atlantic, western Pacific and Indian Oceans. There are six recognized subspecies. The subspecies P. l. catesbyi occurs in Caribbean and Bermuda. The subspecies P. l. ascensionis is found in central and southern Atlantic ocean. P. l. europae is found in Europa Island and south Mozambique Channel. P. l. lepturus occurs in Indian Ocean. The subspecies P. l. fulvus occurs in Christmas Island. P. l. dorotheae occurs in western and central Pacific ocean. 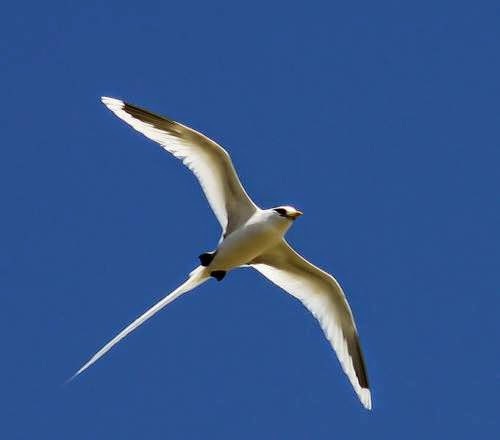 The white-tailed tropicbird is a small bird, measuring 70-80 cm in length of which tail streamer is about 40 cm. The wingspan is nearly 100 cm. They have mostly white plumage and a black band on the inner wing. There is also a black band through the eyes. the bill is orange-yellow to orange red. They feed on fish, flying fish, crustaceans and squids. The males tend to have longer tail trails. These birds breed on the tropical islands. They lay eggs directly on the ground. A single egg is laid and is incubated by both the parents. Current topic in Birds of India: White-tailed tropicbird - Phaethon lepturus. Home › Indian national bird › Red-billed tropicbird › Red-tailed tropicbird - Phaethon rubricauda. The red-tailed tropicbird (Phaethon rubricauda) belongs to the family of tropicbirds, Phaethontidae. These seabirds nest in colonies in remote islands off Indian and Pacific oceans. There are four recognized subspecies of red-tailed tropicbirds. The subspecies P. r. rubricauda occurs in western Indian ocean. The subspecies P. r. westralis is found in the eastern Indian ocean. The subspecies P. r. roseotinctus and P. r. melanorhynchos occur in Pacific ocean. These tropicbirds are small birds, measuring 75-80 cm in length including tail streamers and weighing 600-800 grams. The streamers may measure up to 35 cm in length. They have predominantly white plumage, often with a pink tinge. The long trailing tail feathers are bright crimson in color. The beak is crimson, curved slightly and serrated. The feet are webbed and black in color. There is a black crescent mark around the eyes. These tropicbirds are pelagic birds, rarely seen from the land. They feed by catching their prey from the water surface as well as plunge diving. Their feed consists of fish, flying fish, crustaceans and squids. These birds are monogamous and nest on the ground. The female lays a single egg and both the parents take turns in incubating. The parents feed the chick for two to three months. Current topic in Birds of India: Red-tailed tropicbird - Phaethon rubricauda. Home › Indian national bird › Red junglefowl › Sclater's monal - Lophophorus sclateri. The Sclater's monal (Lophophorus sclateri) belongs to the family of pheasants, Phasianidae. 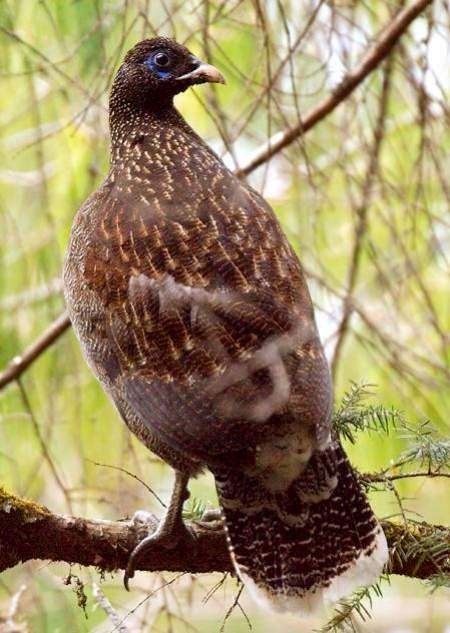 The Sclater's monal are distributed in the east Himalayan region including India, China and Myanmar. There are three recognized subspecies of these monal. The subspecies L. s. orientalis is distributed in Myanmar and China. The subspecies L. s. sclateri occurs in Tibet, Myanmar and Arunachal Pradesh state of India. L. s. arunachalensis occurs in the Arunachal Pradesh state of India. The International Union for Conservation of Nature (IUCN) has categorized and evaluated these bird species and has listed them as of "Vulnerable". The Sclater's monal is a medium sized bird, measuring 60-70 cm in length and weighing 2,000-2,500 grams. The male monal is colorful and is larger than the female bird. These birds have white feathers on the lower back and rump. The upper parts plumage is iridescent purplish-green, metallic green, blue, purple and black. The short curly crown is metallic green. The beak is creamish to yellowish orange. The female monal is dark brown, with a white throat and tail-tip. These birds inhabit mountainous coniferous and bamboo forests of eastern Himalayas, occuring at altitudes of 2,500 to 4,200 metres. They feed on tubers, roots, bulbs, arthropods, rodents, seeds and flowers. Their nest may contain three to five eggs. Current topic in Birds of India: Sclater's monal - Lophophorus sclateri. Home › National bird of India › Great crested grebe › Red-billed tropicbird - Phaethon aethereus. 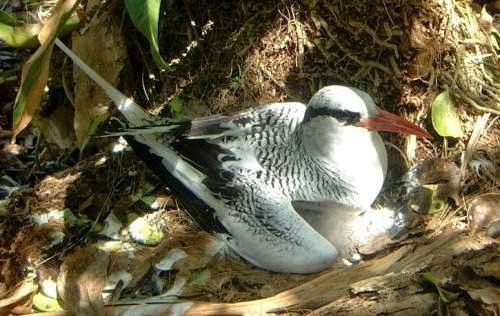 The red-billed tropicbird (Phaethon aethereus), belongs to the tropicbirds family, Phaethontidae. There are three recognized subspecies of red-billed tropicbirds. The subspecies P. a. mesonauta is distributed in the east Pacific ocean, Caribbean sea and east Atlantic ocean. P. a. aethereus is distributed in the south Atlantic ocean. P. a. indicus occurs in Indian ocean, Persian Gulf, Gulf of Aden, Red Sea and occasionally in waters adjoining western Indian islands. These crimson billed tropicbirds are the largest of the three tropicbird species and measure 90-100 cm in length, including the 50 cm long tail streamers. The wingspan is nearly 100 cm. The adult birds weigh around 750 grams. These birds have stout, slightly curved, crimson beak. They have white body with wings having black tips. The upper parts have fine black barring. There is a black stripe passing through the eyes. The males and females appear similar except for the longer tail streamer in the male birds. These crimson billed tropicbirds are pelagic seabirds breeding on remote islands. They feed on fish, flying fish, crustaceans and other pelagic life plucked from the surface of the water or by diving into the water. These tropicbirds breed in loose colonies. The nest usually contain a single egg and the incubation is predominantly by the female bird. The parent tropicbirds take turns to feed the chick. 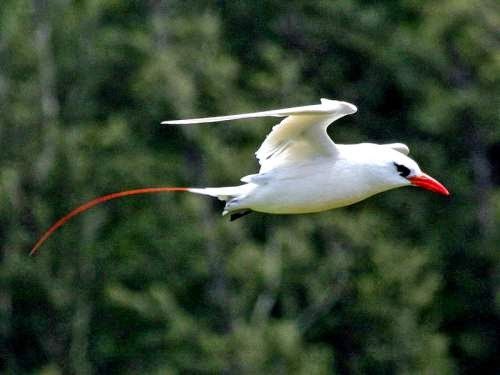 Current topic in Birds of India: Red-billed tropicbird - Phaethon aethereus. Home › Indian national bird › Great crested grebe › Red-necked grebe - Podiceps grisegena. The red-necked grebe (Podiceps grisegena) belong to the grebe family, Podicipedidae. The red-necked grebe are distributed in Europe, America and Asia including Indian subcontinent. There two recognized subspecies of these birds. The subspecies P. g. grisegena occurs in Europe and Asia including India. P. g. holbollii occurs in Russia, China, Korea, Japan, Canada and USA. 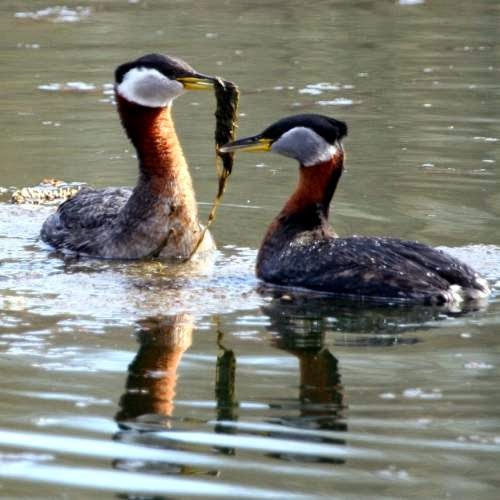 These grebes are migratory birds found in the temperate regions of the northern hemisphere. They are medium sized birds, measuring 40 to 50 cm in length and weighing 500 to 1,600 grams. They have a distinctive breeding plumage, males and females looking alike. They have black cap and chestnut neck. In winter red-necked grebes are seen just beyond the waves on the calmer coasts. They migrate to freshwater lakes, ponds and marshes for breeding. They are good swimmers and divers. To escape danger they would rather dive into the water than fly. These birds feed on fish, crustaceans, insects and molluscs. Red-necked grebes are monogamous birds and breed during April to June. The nest is built near the water edge or on a floating platform. The nest contains four to five eggs. The parents take turns to incubate the eggs. The chicks are fed by the parents. The hatchlings are carried on the back. Current topic in Birds of India: Red-necked grebe - Podiceps grisegena. Home › National bird of India › Horned grebe › Great crested grebe - Podiceps cristatus. The great crested grebe (Podiceps cristatus) belongs to the grebe family, Podicipedidae. The great crested grebe are the largest among the grebes. They are distributed in in Europe, Africa, Australia and Asia including Indian subcontinent. There are three recognized subspecies. The subspecies P. c. cristatus is distributed in Europe and Asia including north India. P. c. infuscatus is the African subspecies and P. c. australis is the Australian subspecies. The International Union for Conservation of Nature (IUCN) has categorized and evaluated these bird species and has listed them of "least concern". The great crested grebe is a medium size bird measuring 40-60 cm length and weighing 500-1500 grams. These birds have a distinctive breeding plumage. Both males and females have similar plumage. The head has a black cap ending in an erectile crest. The juvenile birds have distinctive white and black stripes on the head. They inhabit shallow water bodies with vegetation. They are excellent swimmers and divers. They dive to catch prey and feed on fish, crustaceans, molluscs and insects. They breed during April to July. They begin to pair in the winter and there is distinct courtship display. The nest is made on the water edge or on floating platform. The nest usually contains 2-4 eggs. 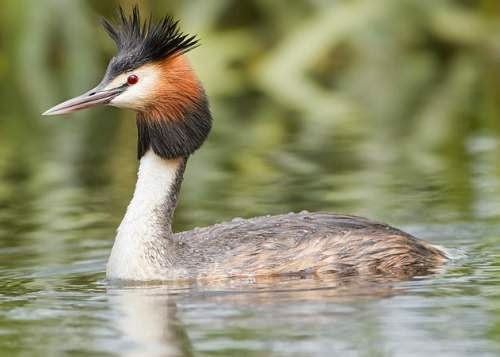 Current topic: Great crested grebe - Podiceps cristatus.